Myself and Dan were on the riverbank, with everything set up, trying to kill half an hour before the season started - it's been a long closed season, but that last half an hour dragged on and on. Eventually the alarm on my phone sounded one minute past twelve - we could fish! We both had bites on our first casts, and in true out-of-practice style we both missed them. My next cast resulted in our first Wandte barbel of the season 12oz - yay! 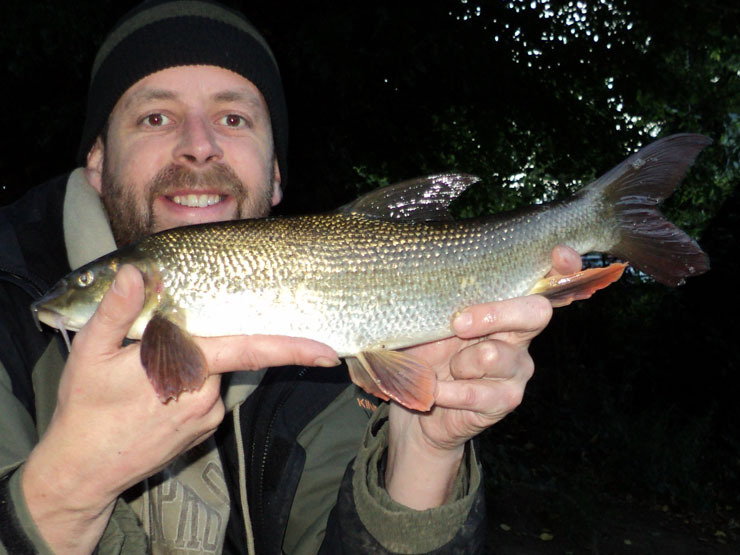 Next cast produced a second 12oz barbel to me before Dan had a 10oz fish. Three fish in five minutes, things were going to plan... Then it slowed right down. Over the next two hours I had a 10oz barbel followed by a 14oz one before Dan tipped us over the pound mark with a 1lb 4oz fish. I then managed an eel of about a pound and a half before it went quiet. A move soon saw me in again, this time it was a proper fish, it didn't want to show itself and soon found a snag right beneath my feet. About 10 agonising minutes later, after trying every trick in the book, I admitted defeat - the line snapped just above the hook. Was this the Wandte double we are after? Another move and I landed two more fish, 2lb 1oz and 2lb 3oz before tiredness took hold and we headed for home about 5am. So the barbel challenge stands at 9lb 2oz (8 fish) with the biggest being 2lb 3oz, not bad for the opening few hours. The bigger barbel will have to wait for another day. Hi! Good start of season! I love to fish for barbel. One of the most powerful fishes! What kind of bait did you use? Hi Jarek, We used cubes of luncheon meat this morning. We did have bait made from halibut pellets, which got bites but we haven't left them long enough to set yet so they were just pulling them off the hook. Fantastic start. Did the big one feel like a barbel or one of those river carp? Those barbel are such a great looking fish. You'll get him next time. Not really showing off - it's a bit hard when the average barbel size is about a pound! But it would be nice to bank a double, I don't care if me or Dan that gets it. It is frustrating when you loose them without seeing them as they fight so hard it impossible to judge if you were connected to a four pounder or a fourteen pounder! People in Poland use often for barbel yellow cheese sunken in milk for 12 hours. IT is the best bait here. Did you ever try? No, I'll give it a try. After a week or two the fish will have seen all of the usual stuff so it's nice to try something new. I'll blog if it works. I'm waiting for your review:) Of course you need to cut cheese in small cubes and then sunk them in milk. Hi last Anonymous, are you fishing the Wandle? (And what's your name?). most def the wandle, is on my doorstep so no need to go elsewhere. Is a very hard water as I have had no bites in the last 2 days, not even a chub rap. Hi Edd, well done on the 8lb'er and the pair of fives. It is a tough river, only my second season there so still finding my way round.